You can check the status of your hard drives in the NMH by following the instructions below. Click on Configuration to continue. Enter the password of the Media Hub. The default password is "admin" for the media hub. Click on the Disk tab. 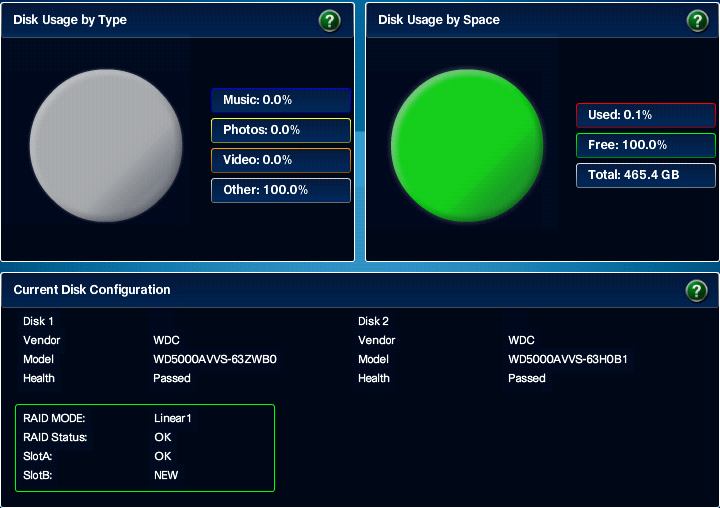 Once the Disk Status page appears, there will be information regarding on the Disk Status like the type of hard disk installed and what RAID is it running on, available disk space and what media consumes how much space on the hard disk. NOTE: If the Health of a Disk shows "Failed", it means that your disk may be at risk. You would need to backup your data in the NMH as soon as possible and it's highly recommended to replace the hard drive. Check with your hard drive manufacturer for repair or replacement.